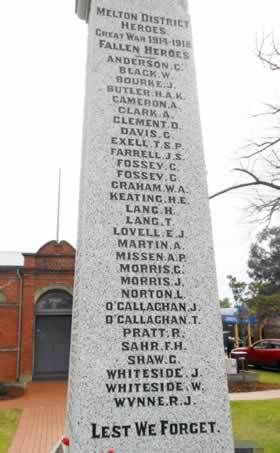 Find out about the World War 1 service personnel with a connection to the Melton area of Victoria, Australia. In researching information for this site it became clear that only some of the Melton area World War One service personnel appear on the cenotaph. If you know of a World War 1 veteran who is not listed on this website, please contact us with details. Interested in tracing your family? The Melton Family History Group offers its services to the public every Wednesday morning, 9.30-12.00. If you need help with any aspect of your research - beginning your family history, working through a “road block”, navigating commercial family research packages like Ancestry, using the microfiche or CD collection, or any other issue – drop in and see us. The Department of Veterans’ Affairs has not participated in the research or production or exercised editorial control over the work’s contents, and the views expressed and conclusions reached herein do not necessarily represents those of the Commonwealth, which expressly disclaims any responsibility for the content or accuracy of the work.